The Australian Golf Club’s Blake Windred has defended his Avondale Medal title by one stroke, closing with a 3-under 68 to erase a three shot deficit and edge out Queensland’s Jediah Morgan for the title. Windred finished the tournament at 9-under-par and stormed home with an impressive back nine 33 after going out in 35 to record four birdies. Windred’s only blemish was a bogey at the par 4 6th. Morgan was another fast finisher and fired the tournament’s second lowest round with a final day 66 to move six places up the leaderboard. Jordan Garner finished in outright third position at 7-under. Third round leader Lewis Hoath, who had positioned himself well with opening rounds of 71-66-67, was not able to get his game going in the final round firing a 80 to fall thirteen places and record a tied 14th result. Local player Jye Pickin held the opening two round lead ofter opening with consecutive rounds of 66, but finished with a pair of 74′s to record a commendable top-6 finish. In the Women’s Avondale Bowl, 16 year old Korean Kumkang Park, known as “KK”, dominated the field to finish with a commanding eight-shot victory. The overnight leader was never headed after holing out for eagle on the 1st hole and finished with a 2-under par 70, the low round of the day on a long and wet Avondale layout. 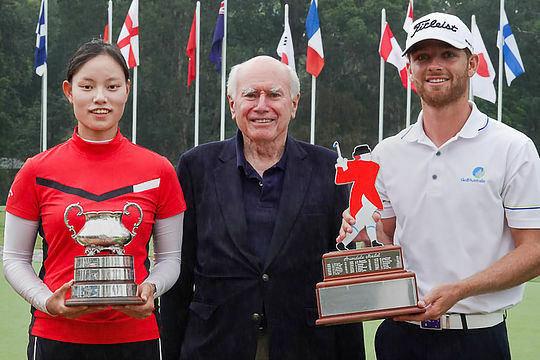 Victorian Amateur Champion, Korean Min A Yoon finished second and edged out New Zealander Carmen Lim and Aussie Hye Park.